I found this website today and I'm totally inspired! There is such a long list of adventures that I have yet to do, but for the time being - I will have to live vicariously and save up some winds for the sails of my next adventure! 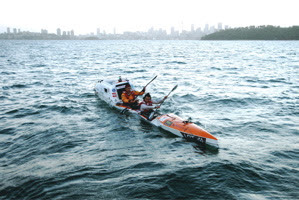 This one is currently in progress... Two Aussie men in their mid 20s (James Castrission and Justin Jones) in a souped up kayak are attempting to cross the Tasman sea, and it looks like they are halfway there! They set out on this journey less than a year after another man, Andrew McAuley, attempted to be the first to cross these waters, but lost his life within sight of land. Here is their official website, where you can log on to find out where they are and how many more miles left to go!